There is no time sequence, only simple logical relations. Many diagrams are really schematic and doesn't represent all nuances - only basic signs. Tremendous work, thank you! I have stored it locally for future reference. I think this is true almost for all manufacturers. Their target was sharpness and contrast, so all corrections were aimed on these qualities and bokeh suffered a bit. 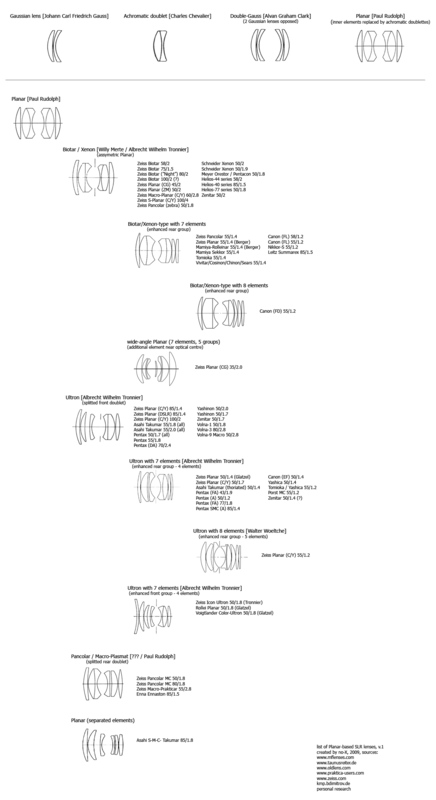 I'll try to make some of the lists a bit more complete by adding some Zeiss-Opton examples. I also forgot the cathegory, which includes 135mm Sonnars/Jupiters. Is the Nikkor-P 105/2.8 the 105/2.5? This is a really interesting diagram, thanks for posting it! Next question, what is the Nikkor 105/2.8 ? Looking here I don't see a 105/2.8 with the required number of elements and groups? If its the second type of 105/2.5, where does the Schneider Xenotar design fit into your scheme? i understand the second design Nikkor 105/2.5 was a Xenotar-style lens. Both Biometar and Primoplan has the same number of elements, cemented doublet at the same position and diaphragm at the same position, too. I'm not physicist, but I think the only difference is in other balace of corrections. Primoplan has strongly curved cemented surface and near symmetrical semifinal element, while Biometar has near flat cemented surface and strongly curved semifinal element. I'll possibly move this lens to different cathegory though. Excellent work - many thanks. This is very well made one..
Well done - a useful piece! Informations about the Steinheil Cassars and others would be helpful, too. A well honoured work you have done with providing your list. Hi no-x, than you for helpful information. What about the Tairs? I think, they are Triplets too. It�s in the same level of your comparision of 35 mm lenses, pancolar, 135 mm, etc. Now I can see why the rendering of my mamiya TL 2,8/135 mm lens (ernostar) is so different than the CZJ 2,5/135 sonnar one. 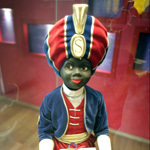 2- The mamiya 2,8/135- 2nd version -DTL- had the same schame than the first version. 3- The mamiya 2,8/135 3rd version is the SX had the same design (4/4) that the 2nd. 5- and Rolleinar is not the last mamiya CS 2,8/135 lens (5/4). Rolleinar-Mamioya isn't clear to me. These Rolleinars were manufactured by Mamiya and because of that I mentioned "Mamiya-Rolleinar" in the list. 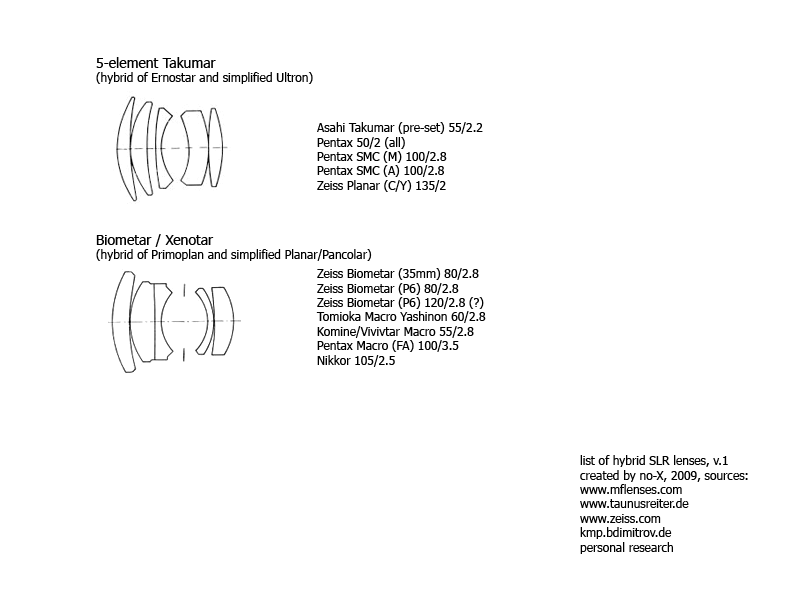 The second, thick element of the rolleinar (same as the present in the sonnars 135 lenses), is more similar to the sonnar 2nd and 3rd cemented elements (in only one element) than to the 2nd ans 3rd elements in the ernostar? The ernostar didn't have a thick 2nd element. The thickness depends on focal length and speed of the particular lens. The longer focal length, the thicker element. 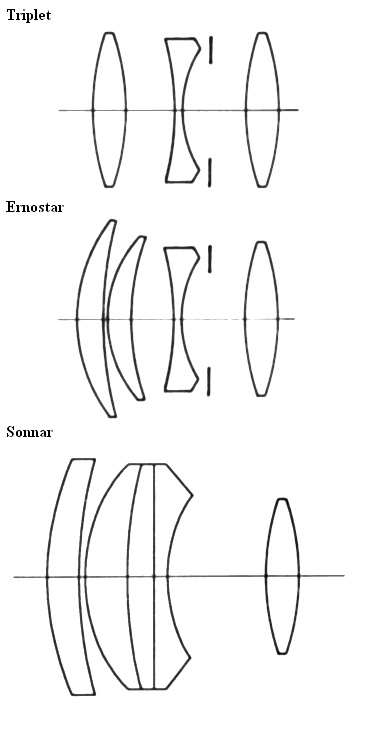 The triplet and ernostar in the picture examples are valid for standard lenses. Basic Ernostar is described as a lens consisting of two positive elements (meniscus), one negative element and one positive element at the end of optical block. 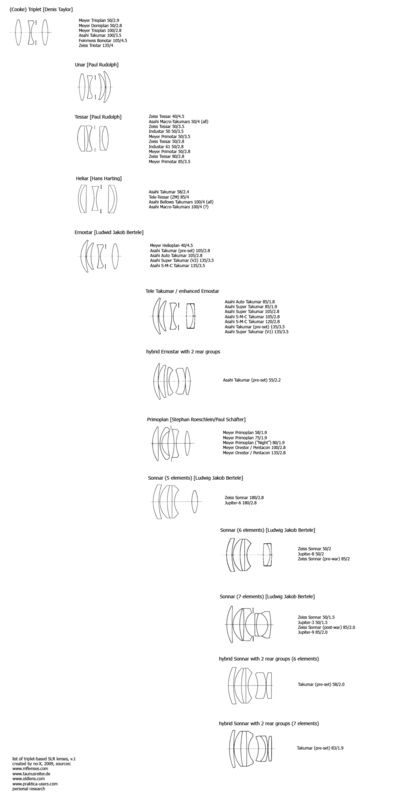 Despite many lenses are marketed as Sonnars, they are based on Ernostar designs and even the patent descriptions call them Ernostars. I'd like to suggest a few lenses to add to your list. 1. Nikkor 135/3.5 (pre-Ai) falls into "Sonnar (simplified, 4 elements)"
2. Nikkor 135/3.5 (Ai, Ai-S), Nikkor-Q 135/2.8 fall into "Ernostar"
3. Nikkor pre-Ai 85/1.8 is "Biotar / Xenon"
4. Nikkor Ai, Ai-S 85/2 are "5-element Takumar (hybrid of Ernostar and simplified Ultron"